The boundaries between Computer Science, Artificial Intelligence and Robotics are becoming thinner, and an interdisciplinary approach is the way to address the complex challenges presented by the marine scenario. New computing approaches and sensor processing techniques such as machine learning are becoming more and more popular to analyze large datasets of sonar and underwater cameras. GPU computing has opened new possibilities for real-time sensing and processing of high data density sensors like Synthetic Aperture Sonar (SAS). Improved sensing, together with a higher degree of autonomy, is increasing the range of possible real world operations.The workshop will explore these interconnections between the different fields with the aim to give an answer to the questions arisen by the Maritime Domain. 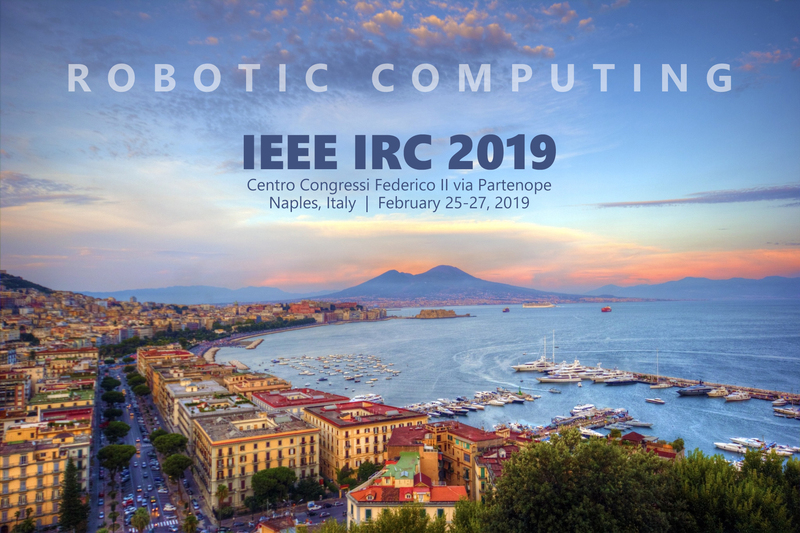 We believe this will stimulate a large interest among the IRC 2019 attendees, both among robotics researchers and among scientists more interested in computing, sensing and AI topics. Please see the Call for Participation for specific topics of the Workshop. The overwhelming push towards the design of robotics software platforms such as ROS, Orocos, SmartSoft, and OpenRTM has been followed by a tremendous pull from industry towards composition-oriented approaches, as these pave the way towards a robotics (software) ecosystem with all its advantages. Domain-Specific Languages (DSLs) and Model-driven Engineering (MDE) are key to this approach, and are growing areas of interest in the robotics research community. They have been instrumental for resolving complex issues in a wide range of domains (e.g., AI, networked, distributed, service and modular robotics, automation, control, and vision) and have the potential for significantly facilitating how robots are programmed. A DSL is a programming language dedicated to a particular problem domain that offers specific notations and abstractions, which, at the same time, decrease the coding complexity and increase programmer productivity within that domain. Models offer a high-level way for domain users to specify the functionality of their system at the right level of abstraction using MDE. DSLs and models have historically been used for programming complex systems. They have however also garnered interest as a separate field of study; this workshop investigates DSLs and models for robotics. DSLs and models have the potential for significantly facilitating how software for robots is developed and managed. Robotic systems blend hardware and software in a holistic way that intrinsically raises many crosscutting concerns (concurrency, uncertainty, time constraints, etc. ), for which reason, traditional general-purpose languages often lead to a poor fit between the language features and the implementation requirements. DSLs and models offer a powerful, systematic way to overcome this problem. The DSLRob series of workshops is devoted to promoting the systematic use of DSLs in robotic systems; DSLRob is based on a combination of high-quality reviews (all DSLRob workshops have relied on a formal peer-review process and published formal open-access proceedings on arxiv.org) and a format that ensures time for interactive discussions (the last edition engaged over 30 researchers in lively debates). An invited talk will be given by Prof. Dr. Christian Schlegel, Hochschule Ulm, Germany, Technical Lead of the EU H2020 project RobMoSys . DLRob is supported by IEEE RAS Technical Committee on Software Engineering for Robotics and Automation (TC-SOFT). Cyber physical systems (CPS) and robots are becoming more involved in the lives of humans. All indications point to a future where many varieties of CPS, robots and humans co-exist and, at a minimum, must interact consistently through life’s tasks. This workshop will explore ideas of the future to understand, discern and develop the relationships between humans, robots and CPS and the practical nature of software agents to facilitate the integration. The general interest of this workshop is the research intersection between humans, agents, robots and machines and sensors. Specifically, how agents can be used in the modeling, design, implementation and experimentation of these complex systems. Intersecting humans and CPS are agents and multiagent systems tasked to map the interaction, communication and networked relationships. The goals of this workshop are to provide a forum to exchange ideas, present results, share experience, and enhance collaborations among researchers, practitioners, and developers in numerous areas of communicative interfaces between humans, robots and other entities. While many traditional robots are limited by a predefined set of alternatives for interactions and collaborations, one of the challenging goals in robotics and computer science is to build future robots and devices in physical or virtual forms that are multi-disciplinary in nature, connected to the world knowledge, and interact with humans to solve general as well as domain specific problems.This workshop will gather people from industry and academia to create an opportunity to discuss how Semantic Computing can be effectively applied for smart interactions between humans and robots for problem solving, where Semantic Computing addresses the derivation, description, generation, integration, and use of the semantics (“meaning”, “context”, “intention”) of sources that may be static, dynamic, structured, semi-structured, unstructured, or a mixture of the above. The aim of Computational Robotics is to perform essential research bridging the gap between artificial intelligence and autonomous robotic systems. By applying advanced computational scientific approach, it is expected to realize deeper understanding of human as well as to solve more complicated computational problems for the next generation of robotics. As a matter of fact, recent advancements in computation have opened doors not only in software, but also in hardware, thus making this one the most ambitious and relevant challenges in robotics. In fact, we know that Computational Robotics is set to shape innovation in the 21st century, underpinning research in a wide range of challenging areas: the ageing population, efficient health care, safer transport, and secure energy. Thus, an entire discipline has emerged devoted to the computational and algorithmic issues arising in robotics. Much of the field of computational has motivation from robotics, leading to a wide variety of algorithmic problems for solving such problems as path planning, camera placement, computer vision, part manipulation, etc. Then, this special session will focus on introducing the area of robotics from a computational point of view, introducing some of the notions of design and analysis of algorithms, using robotics as a motivating application. Computational Robotics presents many challenges with solutions to address real world challenges to improve quality of life. Thus, this organized special issue will focus on computational approaches and methodologies applied to address challenging problems coming from collecting robotic information. We are interested in original ideas and unpublished contributions from different areas of robotics and intelligent systems describing novel nature-inspired computational methodologies and drawing on rigorous quantitative approaches across computer science, mathematics, physics, life sciences and etc. System design, works in progress, and simulations are also welcome, as long as they meet the guidelines of the session. The PhD Symposium on Robotic Computing is meant for PhD students working in the fields of Computer Science, Artificial Intelligence, and Robotics. The intent of the PhD Symposium is to bring together PhD students who have their research focus within the combination of these fields and to offer them the opportunity to present their work, meet with peers and experienced researchers, obtain feedback, and learn from each other’s experiences. The main goal is to provide each PhD student with concrete feedback and advice that are directly relevant to their research. Each participant will also take part in the review process for the other participants.